I often use mince beef in our meal and am always looking for new ways to use it. This dish has to be a favourite in our house. 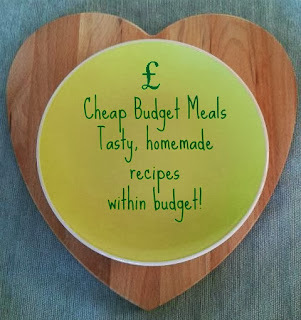 The children and the hubby love the burger style flavour, while I love the fact that it can be made within budget! This week we have had the satisfaction of harvesting some of our own vegetables.We now have potatoes and turnips that are ready to eat. As different vegetables get ready to harvest more of our meals will be featuring these seasonal delights! 1 - Mix together the mince beef, onion, garlic and fresh thyme leaves with your hands in a large bowl ensuring all of the ingredients are evenly combined together. 2 - Give the mixture a good dash of Worcester sauce, we all adore the tangy flavour so I add a generous amount, but this can be altered to taste. 3 - Shape the mince into a loaf shape and place into an oven proof dish. 4 - Place in the centre of the pre heated oven and cook for 30 minutes. 5 - While the meat loaf is cooking prepare and cook your potatoes and chosen vegetables. We had carrots, turnips and cauliflower. 6 - To prepare the pepper sauce bring 150mls of water to the boil and add a beef stock cube. 7 - Stir in the cream and peppercorns then reduce the heat and simmer. I added 2tsps of black peppercorns but again this can be adjusted to taste. 8 - Once the meat loaf is thoroughly cooked remove from the oven and place on a place, cover with foil and leave to rest for 5 minutes before serving. Serve the meat loaf sliced with as much or as little of the pepper sauce over the top. This meal is a great alternative way to use mince beef. One of the great things about it is you can serve whatever vegetables you have in your fridge or as I did I used vegetables from the garden and a cauliflower which needed using up. I cooked this meal for £5.41 as I used some of our homegrown vegetables. That was just £1.08 per serving. But this meal can be made for £6.92 and in this price you would have enough potatoes left for another meal and garlic to use another day! That is just £1.38 per serving if you were to feed 5 as I do. That looks delicious - I do like a homemade meatloaf. How fab that you grown your own veggies, I'm hopeless at that. The prices you quote are all sooooo much cheaper than in France, I think I might have to move to UK! There's no way you can ever get new potatoes for £1.50 a kg here, I'm jealous! I've never thought to make a meatloaf before, this does look tasty and cheap too! Yumm, I love meat loaf. Very economical, but I would make it with rice as I'm not much of a potatoes gal.